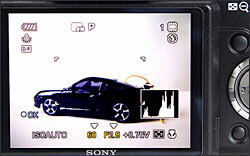 Sony Cybershot DSC-H50 in shooting mode with information and histogram on. 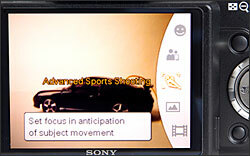 Sony Cybershot DSC-H50 Playback display with information and histogram. 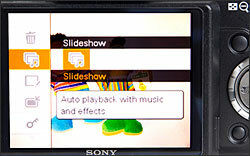 Sony Cybershot DSC-H50 Home screen. 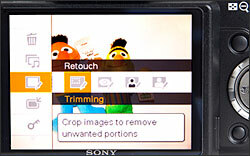 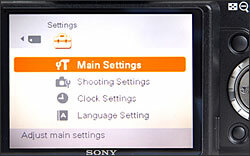 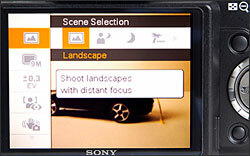 Sony Cybershot DSC-H50 menu screen. 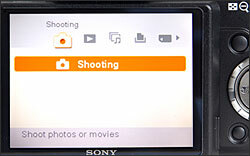 Sony Cybershot DSC-H50 scene mode selection in the shooting menu. 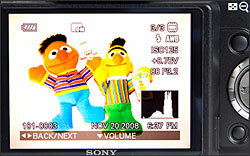 Sony Cybershot DSC-H50 shooting mode selection via the mode dial.